Of late, AP McCoy has become as adept at warding off questions about his long-term future as he has been, for years, at booting home winners. Ever since the 18-time champion jump jockey reached and passed the extraordinary milestone of 4,000 winners, interviewers have been constantly trying to tease out of him a likely retirement day. This week, in reply to one media enquiry about now chasing 5,000 winners, the 39-year-old said: "Who knows? Nothing is impossible." Can Sam Twiston-Davies go on to ride as many winners as AP McCoy? And questioned about the "seemingly fanciful target", he told the Daily Telegraph: "Someone told me once that 'impossible' was only an opinion, not a fact." McCoy is not being awkward. It's simple: while he retains all the old magic - and there's absolutely no doubt at all about that - he's probably fairly unsure of the date himself. The one certainty, however, is one day jump racing's most outstanding career will reach the finishing line, and someone else will get to wear the champion's crown. But who will that be? Most of his current immediate rivals don't have age on their side, except that is for Sam Twiston-Davies, 21, and he has really blossomed this season, demonstrating all the right signs for future greatness. The latest in a string of big-race chances comes in Saturday's International Hurdle at Cheltenham on Champion Hurdle favourite, The New One, trained by his father Nigel. But while it's principally for the stable of 'Nige', as he calls him (rarely, if ever, Dad), that Twiston-Davies junior rides, links with other trainers, particularly ex-champion Paul Nicholls have been growing eye-catchingly. In addition to the rising success rate, the boyish-looking red-head's unaffected manner, easy charm and endearing turn of phrase have started capturing the imagination of the public. McCoy apart, I've rarely witnessed so many fans flocking around a jockey, hungry for photographs and signatures, as were mobbing Twiston-Davies on Becher Chase day at Aintree. More senior members of jockeys' changing room speak of a "very level-headed young man", who doesn't drink alcohol and smiles a lot, but who has a steely determination in the saddle. Nigel Twiston-Davies's assistant Carl Llewellyn, the winner of two Grand Nationals when a leading jockey himself, certainly believes he recognises what's happening. He told me: "Sam's riding brilliantly, getting loads of winners, and is just a really nice, genuine guy, and nothing's too much trouble." "I'm not surprised people are talking about him more and more in those terms: he ticks all the boxes in terms of riding and being an ambassador for the sport." The New One, ahead of My Tent Or Yours, Our Conor and reigning champion Hurricane Fly in the Champion Hurdle betting, ran away with the Neptune Novices Hurdle, staged over a bit more than two-and-a-half miles, at March's Cheltenham Festival. First time out this season, back at two miles, the championship distance, the five-year-old easily disposed of Rock On Ruby, the 2011 Champion, and Llewellyn thinks the horse is now better than ever. He said: "It's funny, but he seems to have got quicker and developed a good turn of foot, so coming back in trip from the Festival hasn't been too much of a worry. "We thought he was lacking that bit of speed last year, otherwise he'd probably have gone for the [shorter] Supreme Novices Hurdle. "Remember, two multiple Champion Hurdlers, Istabraq (1997) and Hardy Eustace (2003) won the same race, so we're in good company. It would be great to go the same route." 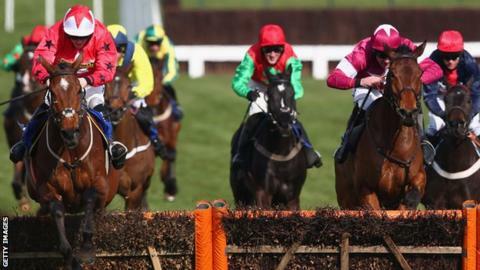 Follow the StanJames.com International Hurdle (1500) and all the news from Cheltenham on Sat Dec 14 on BBC Radio 5 Live and on the BBC website.